Kudryashov vs Dorticos = Guaranteed Explosion! 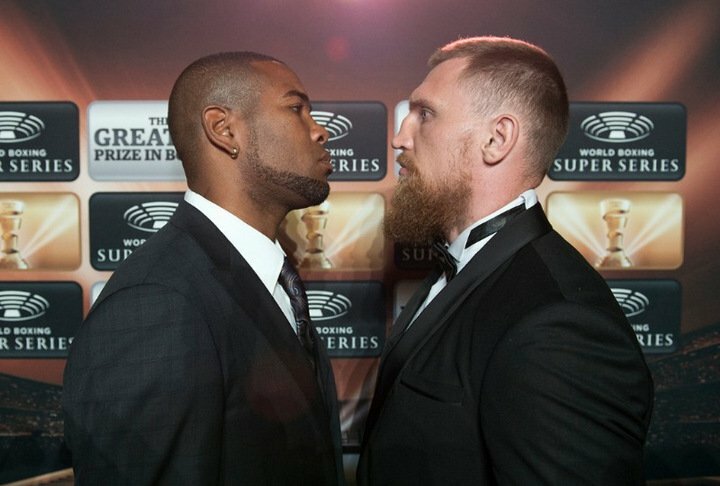 Between them, cruiserweight bangers Dmitriy Kudryashov and Yunier Dorticos have 41 KO’s. Russia’s Kudryashov, 21-1(21) has displayed brutal power in both hands, Cuba’s Dorticos, 21-0(20) has never lost a fight. Together, the two 200 pounders will almost certainly give us an explosion of an exciting fight when they hook up on September 23 at The Alamodome in San Antonio. Meeting up in a battle that is part of the fascinating World Boxing Super Series tournament, the sluggers with the combined 42-1 record (Kudryashov losing once, to Olanrewaju Durodola, later avenging the stoppage loss with one of his own) will contest the WBA belt. As potentially thrilling as this fight is, it’s also a pretty tough one to pick. On the one hand, 31 year old Dorticos is unbeaten, he has arguably faced the better quality of pro opposition and he won the interim version of the WBA belt in his last fight. On the other hand, 31 year old Kudryashov hits harder, he has been more active recently (Dorticos not having fought since May of last year) and he has shown how he can end ANY fight in a single second. But on the other hand still, Dorticos has shown he can go 10 rounds if need be (Edison Miranda, himself a powerful puncher, managing to extend the Cuban), while Kudryashov is yet to go beyond the 7th round. The whole WBSS tournament is a great prospect (as too is the super-middleweight version) and this fight could well prove the most exciting. In fact, all fights involving Kudryashov cannot fail to be exciting affairs. But how far can the bearded Russian terror advance in the tournament? With excellent fighters: Oleksandr Usyk (the early betting favourite), Marco Huck, Murat Gassiev, Krzysztof Wlodarczyk, Mairis Breidis, Mike Perez and Kudryashov and Dorticos taking part, there could be some great, great fights. One of the most potentially memorable episodes in the history of the cruiserweight division (once a mocked or virtually ignored weight division), the upcoming tournament could also be one of the boxing highlights of 2017/2018. And Kudryashov-Dorticos might just be the fight to kick it all off in grand style. All following fights may have a tough, tough act to follow. Who wins on September 23? It’s anyone’s pick, but one thing is sure – no way does this one go the distance! You are here: Home / Boxing News / Kudryashov vs Dorticos = Guaranteed Explosion!